Exceptionally rare: The story of Troy as a secular mystery play. – Unique copy of the fifth edition, the second to contain the lively woodcut series of the first edition. 277 x 197 mm – 209 leaves (lacking text leaf a8). With 32 almost half-page woodcuts (of 28 blocks). Jacques Millet (or Milet; c. 1425-1466) wrote his renowned secular mystery play The story of the destruction of Troy the Great between 1450-1452. Millet based the work on Guido delle Colonne’s 13th century Historia destructionis Troiae, and transformed the Latin prose into this French drama. His play went on to become the first secular drama in print in 1484. 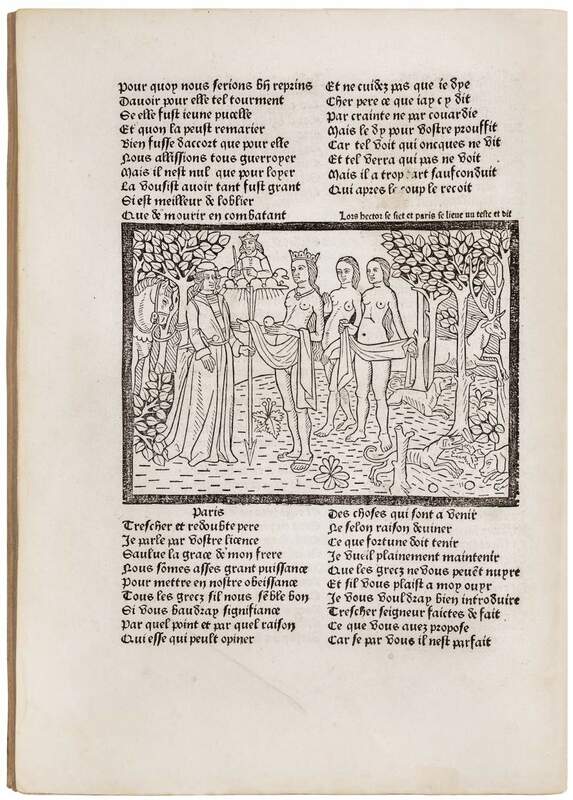 The woodcuts in this unique copy are certainly to be counted among the finest ever produced in that medium, and among the earliest made in France. All images seem to have been designed by the same accomplished artist. The woodcuts are full of life and movement, often abundant in figures set within innovative compositions. All 15th- and 16th-century editions of this work are extremely rare: no edition survived in more than six copies. The present fifth edition – the second Bonhomme edition, which contains the woodcut series of the first – is particularly scarce as no other copy is known.